October is a busy month for the North Bay & District Chamber of Commerce as we ready ourselves for Business Week, which takes place next week from the 16th to the 20th. This is an annual event which promotes and assist’s businesses throughout our area to learn, share, network and socialize with their peers. The week’s events include workshops with Ontario Export Services on Monday & Tuesday, panel discussion breakfast on Innovation/Tech on Wednesday by the Business Centre Nipissing Parry Sound, Business After Hours-Mini Trade Show at Titanium Transportation on Wednesday afternoon/evening, Facebook for Business 101 in Mattawa on Thursday hosted by The Business Centre Nipissing Parry Sound, and the Bell Evening of Excellence Awards on Thursday night at The Grande Event Centre. Fridays wrap up event will also be hosted by The Business Centre Nipissing Parry Sound in Callander where they will hold an Expo including workshops and networking. For information on any of these events or workshops, please visit our webpage http://nbdcc.ca/wp-content/uploads/2012/07/NBDCC-BusinessWeek2017-highrez-2.pdf for details. This is a week to celebrate businesses and recognize leaders in our area that contribute to our economic success and prosperity for our community. The variety of events that are being held next week are only possible because of the many partnerships and sponsors that continue to work together to promote our business community and the area which we live in. 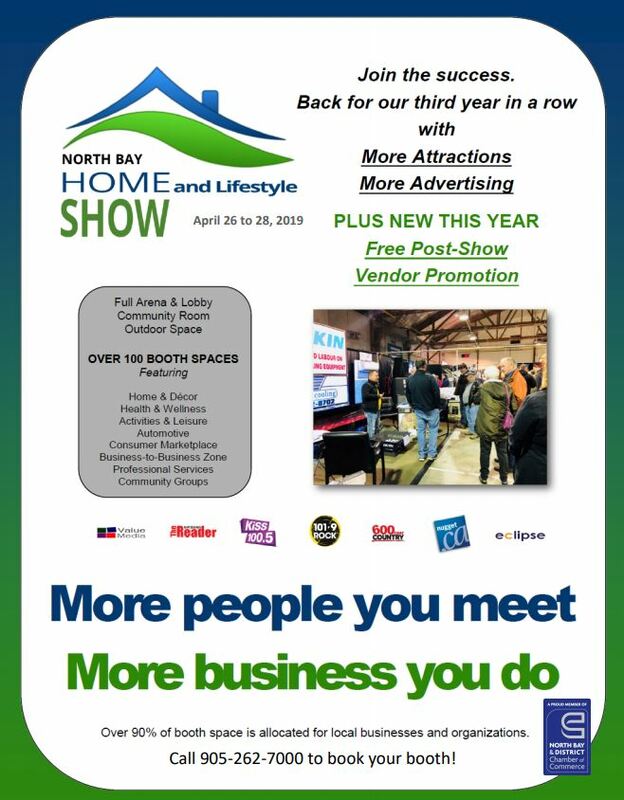 On behalf of all our members at the North Bay & District Chamber of Commerce, thank you to all our partners and members who make this week-long event, a huge success each year. When we take the time to reflect on some of the hurdles that have been thrown at the business community over the past few months including the proposed Federal Tax reforms and Bill 148, Fair Workplaces, Better Jobs Act, 2017, we are encouraged that businesses are standing up and saying enough is enough. Even when it appears that the light at the end of the tunnel is fading, those business owners and their employees get up each day and go to work to continue and contribute to the success of this area. The resilience and fortitude of those individuals is amazing and we do have to remember that they are the life blood of not only our area, but our Province and Country. Next week, come out and celebrate with our members, partners and sponsors, the achievements and commitment that our area businesses, have to our community.